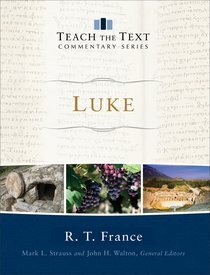 About "Luke (Teach The Text Commentary Series)"
R. T. France is Hon. Research Fellow in the Department of Theology and Religious Studies, University of Wales, Bangor. His many other books include The Gospel of Mark (both for the People's Bible Commentary and the New International Greek New Testament Commentary), The Gospel of Matthew (both the Tyndale New Testament Commentary and New International Commentary of the New Testament) and Women in the Church's Ministry: A Test-Case for Biblical Hermeneutics.